FRISCO, Tex. – Dallas Stars General Manager Joe Nieuwendyk announced today that the club has hired Glen Gulutzan (pronounced Gull-it-zen) as the 21st head coach in franchise history. Gulutzan has signed a two-year contract with a club option for a third season. Gulutzan, 39, has served as head coach of the Texas Stars, Dallas’ primary development affiliate in the American Hockey League (AHL), for the past two seasons. He led the club to the AHL Playoffs in both campaigns and coached the Stars to the Calder Cup Finals in the franchise’s inaugural season of 2009-10. Gulutzan posted a cumulative 87-56-17 record (.597 points percentage) during the regular season and a 16-14 (.533 winning percentage) record during the playoffs with Texas. The native of Hudson Bay, Saskatchewan, served as general manager and head coach for the Las Vegas Wranglers of the ECHL from 2003 to 2009. He compiled a record of 254-124-55 for a .650 winning percentage, including 100+ points in three consecutive seasons (2005-2008), a first for any team in the 21-year history of the ECHL. Gulutzan took the Wranglers to the Kelly Cup Finals in 2008 and to the Conference Finals in 2009. 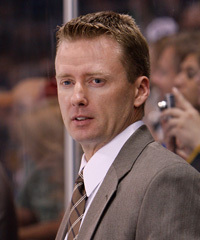 In 2005-06, Gulutzan was recognized as the ECHL Coach of the Year. He led Las Vegas to the playoffs in five of six seasons, including their expansion season (2003-04) when the team went 43-22-7 for 93 points. In addition, he was selected to coach in the ECHL All-Star Game three times. He led the Wranglers to the division crown in back-to-back seasons in 2006-07 and 2007-08. Gulutzan has missed the playoffs in only one season as a head coach and holds a perfect 5-0 record in game sevens in the playoffs. Before beginning his coaching career, Gulutzan played professionally in Europe for two seasons and joined Fresno of the West Coast Hockey League in 1996-97, setting a team record with 80 assists and 110 points in 60 games. He spent a total of six seasons with Fresno, including the last four as player-assistant coach from 1999-2003. Gulutzan also played in the International Hockey League with Utah and Las Vegas, as well as stints in Finland and Sweden. In 1996, he earned a Bachelor’s degree in Education from the University of Saskatchewan. Gulutzan graduated with a major in Kinesiology and minor in Mathematics. Glen and his wife, Nicole, have four children - son, Landen, and daughters, Emma, Brielle and Grace.